The fifteen year-olds just won’t stop! (Cf. yesterday’s post.) When the Vaseline Burglar (no, not one who steals Vaseline, nor are there untoward connotations) broke into the home of Mrs. Julius Rehak to grease up Mary Rehak’s engagement ring-encrusted hand, telling her “keep quiet or I’ll throw acid in your face,” little did he know he’d come in contact with redoubtable 15yo Wilma Rehak, who told him to throw up his hands. As he was not immediately forthcoming, from her steady hand a six shooter erupted with a terrific explosion, missing the interloper by inches, and sending him into precipitous flight. Afterwards, when they examined the attic, they found evidence that he’d hidden for days up there, nourishing his evil plans with a diet of orange juice and liquor, quietly scheming during banking hours, constructing his army of robot helpers after everyone went home. Ah, yes, the robot helpers. 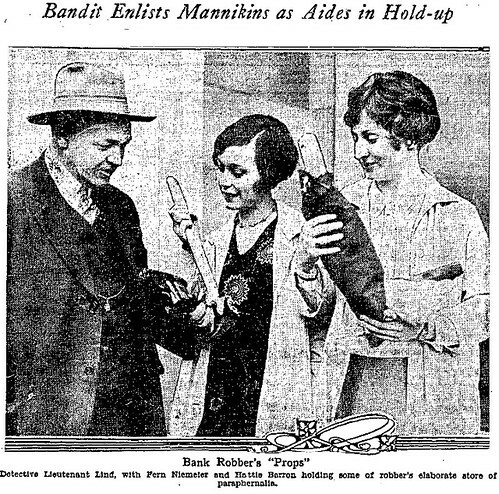 These were artificial arms with toy guns in their “hands,” constructed with ropes and weights to smash through the ceiling of the Merchants’ National Trust and Savings Bank branch at 24th and Hoover just as the robber, clad in a hideous monkey mask, confronted his prey. Who would dare take on the robber while unseen, if strangely still, friends held the room at gunpoint? And so it was that the robber, Luger in one hand and .22 in the other, held up Manager Philip Simon and five employees and relieved Simon of about $8400 in bills prepped for the day’s banking. He was hard to ID beneath the gruesome cheesecloth monkey mask covering the upper portion of his face, but his victims noted that he was a small man, with a distinctive jaw and thick foreign accent with which he called some of them by name, apparently having spied on the workers during his time above. This was the second peculiar robbery to befall Merchants’ National in less than a week; on March 25, two cliche Old West cowboys armed with .45s ambled into the branch at Jefferson and San Pedro and courteously relieved the cash drawers of about $2000 after suggesting customers and staff find comfy spots on the floor. As for our mad attic genius, he made a clean getaway, and his identity remained mysterious until November 2, 1929, when officers stopped a man named Pete Marzec (aka Pete Nanzec), 33, while he was walking near Seventeenth and Main. They asked if they could open his suitcase, and Marzec obliged, but around the time they pulled out his gun, rope ladder and mask collection, he made a dash for a nearby fence. He didn’t make it; a bullet through the gut sent him to Georgia Street Receiving Hospital in critical condition. Later, more burglary tools and guns were found in his room nearby at 1622 Santee Court. Marzec recovered in time to be indicted on the 1927 job and an earlier bank robbery that netted $12,600. Despite the claims of a confederate that he was in Kansas City at the time of the crimes, Marzec was damned by the discovery of guns recognized by his victims, masks matching those worn in the robberies, and a notebook in which the dates and amounts taken from the banks was noted in Polish. Marzec was a three time loser who as Michael Blevika had escaped from a New Mexico Prison in 1922, so his conviction came with a minimum sentence of 14 years in Folsom Prison. Superior Judge McComb, perhaps in recognition of the extra robbers unable to be tried for the crimes, doubled the sentence to 28. Marzec appealed on the grounds that it was unfair to convict someone of both burglary and robbery for the same crime, but was denied, and shuffled off to prison, where we trust he built many imaginary friends to protect himself and keep off the lonelies in the long, dark nights. A classroom of children from the Thornton Avenue School learned a little something about the value of a dollar this afternoon when they witnessed a hold-up outside the Merchants Trust and Savings Bank at 25th and Central. Harry Harris, the bank messenger for City Dye Works (3000 Central Ave.), was accosted at gunpoint by two bandits and relieved of the $3000 deposit he was about to make for his employer. When guns were brandished, the children "set up a din of screams and wails that would do justice to the most powerful siren." However, their cries did nothing to dissuade Harris’s attackers. After being robbed, Harris commandeered a civilian vehicle and followed the getaway car four blocks east on 25th before losing the bandits. The school group had been taking a class trip to the bank to make their monthly deposits as part of the Los Angeles Banks School Savings Association’s "school thrift plan." While similar programs existed elsewhere in the country, the Los Angeles plan differed slightly, in that it sought to give the children more face time with their local bankers. Students were given home safes, passbooks, and made their own deposits. Perhaps as a result of this hands-on approach, Los Angeles schoolchildren had the largest average savings accounts in the country. In 1927, 184 elementary and junior high schools in Los Angeles participated in the program, and students had close to 1 million dollars socked away in Los Angeles banks.